Uglyworld #1531 - Intemellectuals Properties (Project TW - Image 129-366), a photo by www.bazpics.com on Flickr. Todays I hostereds my seconds lecturer heres in Cambridgers, this times it was for the laws departmenter where I explainereds the reasons for havings securities surrounderings the recipe for the perfecters triple choco chippo cookie. We wents over alls the available optioners like trademarkerings the "streets name" of the cookie, and employerings IP which is shorters for "intemellectuals properties" insiders the companies too. One of the smarterers studenters askereds me for a non-cookie based explamanation, so I sendereds him to the locals supermarketer for the perfecters example, Irn-Bru, as the recipe is still a mega biggers secret that only one person has accesses to. 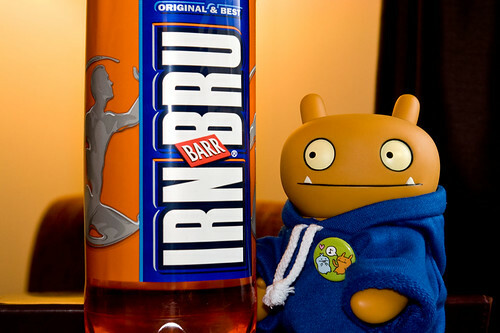 Now that was the perfecters explamanation for IP, and even betters I now has a biggers bottler of Irn-Bru to enjoys!